Does the GeForce GTX 670 Spell Trouble For AMD? After many months of talking up its latest architecture, Nvidia reclaimed the single-GPU performance crown with its GeForce GTX 680, which outpaced the Radeon HD 7970 by about 7% in our tests. Kepler's arrival forced AMD to slash prices across its Southern Islands lineup, including a $70 drop on the HD 7970, putting it at $479 or about 4% cheaper than the GTX 680's MSRP of $499. The HD 7950 also took a $60 cut to $399, making it one of the most tempting 7000 series cards because it has no equal — or had no equal, we should say. Continuing Kepler's rollout, Nvidia has unveiled the GTX 670, which is priced against the HD 7950 at $399. Despite being $100 cheaper than the GTX 680, the GTX 670 doesn't appear to be much slower on paper, and that could spell disaster for AMD. The GTX 670 shares the GTX 680's DNA, as it's powered by the same GK104 GPU and has many other similarities. For example, it uses 2GB of GDDR5 memory clocked at 6GHz and features the new SMX units and GPU Boost technology. Although it's targeting the HD 7950's pricing, Nvidia says its crosshairs are actually on the HD 7970 in terms of performance. Again, a scary notion for AMD. All this posturing means very little if gamers can't actually buy GTX 600 series products. It's been nearly two months since the GTX 680 launched, but as of writing, you can't purchase one online. Poor availability not only means that it's hard to find a GTX 680, but it also means many people have paid more than the $499 MSRP, which dents the card's full value potential. 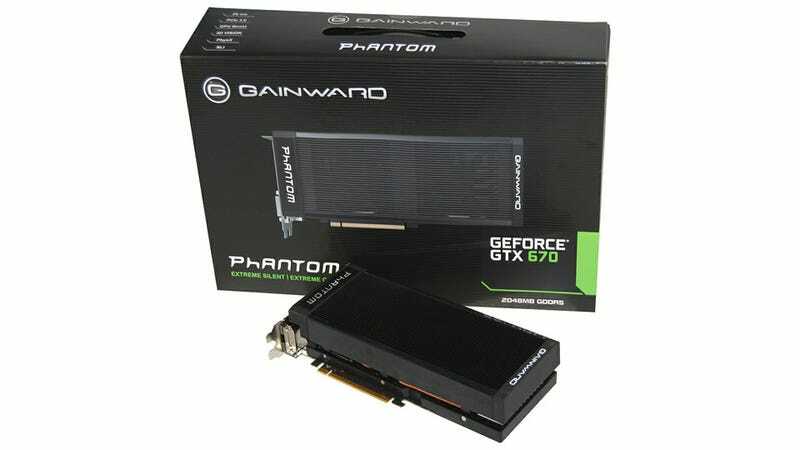 Having recently reviewed Gainward's GeForce GTX 680 Phantom, we're pleased to be looking at the company's premium version of the GTX 670. The Phantom edition card boasts a reworked PCB with an upgraded power phase, factory overclocking and a massive triple slot cooler. Gainward used the GTX 680 to introduce its second-generation Phantom cooler, and the GTX 670 receives the same treatment. The GTX 670's Phantom heatsink measures 185mm long, 70mm wide and 17mm tall (7.28in x 2.75in x 0.66in), making it considerably smaller than the GTX 680's 225mm x 70mm x 40mm heatsink. It has a black fan shroud that forces the 80mm fans to draw air in through the grill above them and push it over fins below. Although the smaller heatsink surprised us, we're more shocked at how compact the GTX 670 Phantom's PCB is. Without a cooler, it measures only 17.3cm (6.81in) long, making the shortest high-performance graphics card we've seen. To put this in perspective, the Radeon HD 6450 also measures 17cm and that's an ultra-low-end HTPC card. With the heatsink and shroud installed, the GTX 670 Phantom is 24.3cm (9.56in) long, which is still slightly shorter than the GTX 680's 25.5cm body. You'll notice some layout changes between the GTX 670 and 680. Nvidia moved the power supply to the west side of the GPU (much closer than on traditional boards), then rotated the chip to improve power integrity and increase efficiency. With the GTX 670's power circuitry moved to the other side of the board, the right side of the PCB was empty and thus removed to save space. Whereas the GTX 680 Phantom had a large heatspreader that covered its entire PCB to cool the GDDR5 memory and 6-phase power, the GTX 670 Phantom abandoned this design. Instead, the GDDR5 memory is naked while the power phase is cooled by a separate aluminum heatsink. Gainward also performed a little factory overclocking, but before we talk clock speeds, let's explore the GTX 670's GPU in a little more detail. The card ships with 1344 CUDA cores and 7 SMX units, 1 SMX unit and 192 CUDA cores less than the GTX 680. There are also slightly less TAUs, 112 down from 128, while the ROPs remain at 32. The memory subsystem is identical to the GTX 680, consisting of four 64-bit controllers (256-bit) with 2GB of GDDR5 memory clocked at 6008MHz (DDR). The memory bandwidth remains at 192.2GB/s. Nvidia's specification for the base clock frequency is 915MHz while the average Boost Clock speed is 980MHz. Gainward has increased the base clock frequency to 1006MHz, while the memory operates at 6108MHz, boosting the bandwidth to 195.5GB/s. The rest of Gainward's card remains fairly standard, including a pair of SLI connectors, 6-pin and 8-pin PCIe power connectors, and an I/O panel configuration consisting of HDMI, DisplayPort and two DVI ports. Impressively, the GTX 670 delivered virtually the same score as the GTX 590 in the 3DMark 11 extreme test, while it was 10% faster than the HD 7970 and just 8% slower than the GTX 680.